At the great chariot festival in the holy city of Puri, Sri Chaitanya Mahaprabhu danced in ecstasy before the chariot of Lord Jagannatha, revealing a most intimate pastime of the Supreme Lord. These days you might see Lord Jagannatha parade majestically through Trafalgar Square in London or along the sun-drenched beaches of Los Angeles; or you might watch the dome of His chariot float past the skyscrapers of New York or the mountains that rim Denver; or you might gaze at the massive wheels as they turn in Toronto, Guadalajara, or Florence. All around the globe. Lord Jagannatha boards His stately chariot and, escorted by dancing and chanting devotees, goes out to see and be seen by all the people of His domain. The festival is not new. Since time beyond memory, the celebrated Deity of Krishna known as Jagannatha (“Lord of the Universe”) has been honored with a great chariot parade at Jagannatha Puri, a city in Orissa on the Bay of Bengal. Every summer pilgrims gather from all over India to join in the awesome and magnificent celebration, in which the Supreme Personality of Godhead graces everyone—highborn or low, pure or impure, rich or poor—with His presence when He leaves His palatial temple and travels in state to His peaceful summer retreat. Long before you reach the city you can see the temple’s majestic parabolic dome, topped by a golden chakra—the discus that symbolizes the all- pervading power of God. On first sight of the gleaming chakra pilgrims fall prostrate in obeisance on the road. The awe-inspiring grandeur of the temple at Puri is entirely apposite, for the Deity of Jagannatha memorializes Krishna, the Supreme Personality of Godhead, as He manifest Himself at Dvaraka fifty centuries ago. There, as part of His personal pastimes on earth, Lord Krishna reigned as king in dazzling splendor and revealed the unsurpassable opulence and majesty of His Godhood. In Dvaraka, Lord Krishna kept close company with Lord Balarama, His brother, and Srimati Subhadra, His sister. Balarama is the Supreme Personality of Godhead’s first expansion; Subhadra, one of His internal spiritual energies. Since the three divine persons were always together at Dvaraka, the form of Jagannatha at Puri is worshiped with those of Balarama and Subhadra. It is important to understand the Deity form of God properly. God appears in this form out of His supreme kindness. The eternal spiritual form of the Lord cannot be apprehended by our materially contaminated senses; therefore He graciously condescends to take a form we can directly perceive and serve. God is not stone or wood, but by His omnipotence He can appear as stone or wood and be perceptible even to our dulled and constricted vision. Therefore, Lord Jagannatha is the Supreme Personality of Godhead Himself. Even though God so kindly makes Himself available to us, there is still a problem. Knowledge of the Lord’s personal form is revealed at the height of spiritual attainment, and worship of the form as the Deity in the temple is a most exalted mode of devotional service. People who are degraded by culture and habit, who are not purified by reformatory practices, who are not enlightened by transcendental knowledge, cannot understand the personal form of God or appreciate the Deity incarnation of the Lord. Such people are likely to mistake the bona fide Deity for an idol fabricated by human imagination. Therefore, to prevent the ignorant from committing offenses to the Lord, people without the benefits of spiritual culture have been traditionally excluded from temples in India. Yet this exclusiveness contrasts markedly with that divine spirit of liberality which moves God to make Himself available in the Deity form. He wants to extend His mercy to everyone. Exclusiveness and inclusiveness are thus in tension. The Ratha-yatra chariot festival helps resolve the difficulty. For on this occasion Lord Jagannatha goes out into the streets and discloses Himself to those from whom He is normally hidden. Lord Jagannatha is accordingly celebrated for being the most merciful even to the degraded and spiritually backward people. Yet Jagannatha’s liberal self-disclosure sometimes produced the feared result. In the Middle Ages, Christian missionaries began occasionally showing up at the chariot festival. Around 1320 one Friar Odoric brought the first report of the celebration back to Europe. The misinformation and misunderstanding he conveyed became part of a standard account that endured in Europe for centuries. This account described Jagannatha as a bloodthirsty idol who demanded—and received—human sacrifice. During the chariot festival—the occasion fixed for this bloody sacrifice—frenzied devotees flung themselves by the score under the huge turning wheels of the chariot to be crushed in self-immolation. Thus the ravening bloodlust of the god was satisfied. Although scholars agree that the calumnious image of Jagannatha and His festival was wholly spurious, it became solidly entrenched, so much so that it gave the English the word “juggernaut,” meaning an overwhelming force that crushes everything in its path. Now that Lord Jagannatha’s Ratha-yatra is witnessed in cities all over the world, people are surprised by its old European reputation as a horrible and gory spectacle. The world has learned to appreciate the festival as a splendid and happy celebration of notable beneficence. At the same time, Ratha-yatra has a profound inner spiritual significance few have yet realized. We can best grasp that deep meaning by looking back in history—back in fact to the same period that saw a perverted conception of the festival take root in Europe. During those days certain marvelous deeds were manifest at Jagannatha Puri. These deeds were so extraordinary that they disclosed the most profound and rare spiritual truths at the heart of Jagannatha’s festival, so momentous that they eventually changed the religious topography of the world. They were all enacted by Sri Chaitanya Mahaprabhu. To save the conditioned souls languishing miserably in material existence, the Supreme Lord periodically descends to this earth. Sri Chaitanya Mahaprabhu is one of these divine incarnations, but this appearance of the Lord is unique. It bears a very special significance. To understand this, we have to see the Lord’s descent as Sri Chaitanya in connection with His immediately preceding descent five thousand years ago. This appearance was also special. Although God manifests Himself many times, He hardly ever reveals His highest and most confidential feature. Almost always God shows Himself in His full transcendental majesty, power, and opulence; and we His creatures naturally respond to this awesome numinous majesty with fear and reverence. Our love for God is united to a powerful awareness of our own creatureliness, our radical inferiority, and we therefore worship the Lord with great awe and veneration. In the spiritual literature of India, God in this majestic aspect is known by the name of Vishnu (“the all-pervading”) or Narayana (“the resting place of all beings”). In His Narayana feature. God is manifest as the Lord of creation, the almighty controller and maintainer of all beings. At the same time, God is the supreme enjoyer, the infinite relisher of loving relations. But reverential worship, appropriate though it may be, holds love at the distance mandated by respect and keeps it under the constraints of formality. Religions usually teach nothing higher than reverential devotion; although such devotion is certainly laudable, by its own nature it is limited in intimacy, intensity, and spontaneity. It does not come near to satisfying the divine capacity for enjoying relationships of love. Therefore we can understand that devotional service to God must go further than awe and reverence, and that the majestic aspect of God, which elicits such awe and reverence, cannot be the last word in divinity. There is even more to God than that, and to our great good fortune, God disclosed this highest personal feature of Himself when He descended five thousand years ago as Krishna. The great Vedic text Srimad- Bhagavatam explains that Krishna is the highest and original Personality of Godhead, and He expands Himself into uncountable plenary portions, known as Vishnu or Narayana. The difference between Narayana and Krishna can be understood like this: as Narayana, God’s majesty overwhelms His beauty; as Krishna, God’s beauty overwhelms His majesty. The name Krishna in fact means “all-attractive,” and Krishna is the last word in divinity. The Vedic texts go further: they describe the kingdom of God as an infinite and self-effulgent sky, filled with innumerable spiritual abodes or planets called Vaikunthas. On each Vaikuntha planet dwells a majestic Narayana expansion of God in the midst of liberated devotees who perpetually worship Him in reverence. But higher than all the Vaikunthas is the supreme abode known as Goloka Vrindavana. In the Vaikunthas, the Lord is present in regal opulence, with all the trappings and appurtenances of the divine majesty. But in Goloka Vrindavana all that is put aside, and the Supreme Personality of Godhead appears as Krishna—a simple cowherd boy; He does not dwell in a palatial estate but in an unpretentious rural village, tucked away among verdant forests and blossoming meadows. Yet there is no greater abode. The residents of Vrindavana worship Krishna with direct and unceremonious spontaneity. So that He may enjoy intimate relationships, Krishna causes His devotees to see Him as their equal or even their inferior, and He plays the part of close friend or playmate, of son, grandson, or nephew, or, most intimately, of youthful paramour. By Krishna’s arrangement, the residents of Vrindavana do not even know that Krishna is God—or, if they know, they are not interested. Awareness of the Lord’s power and majesty would simply get in the way of their love. These are God’s supreme devotees. God is reluctant to reveal His private affairs to the world because the souls here are envious of Him and first of all need to acquiesce to His categorical supremacy. Therefore, the Lord almost always reveals Himself in full majesty. In doing that, He must necessarily withhold His most attractive feature. But once in a great while He descends directly as Krishna. When Krishna descends, He brings all Vrindavana—including all its supremely devoted residents—with Him. Thus for a time the highest transcendental abode miraculously unfolds without limit within the confines of mundane geography. The world can see for once the highest and most confidential life of God. Krishna’s personal appearance is rare, but whenever He does come. He is always followed by another very special divine incarnation: Sri Chaitanya Mahaprabhu. Sri Chaitanya is Krishna Himself, but in this case, Krishna does not appear as Krishna but as the supreme devotee of Krishna. Krishna becomes His own devotee for two reasons. He is so attracted and amazed by the intensity and purity of the devotional love of the foremost Vrindavana devotee, Srimati Radharani, that He wants to experience Her ecstatic love for Himself. So Krishna assumes the feelings and golden complexion of Radharani and thus appears as Sri Chaitanya Mahaprabhu. This is Krishna’s internal, or personal, reason. Here is the other—the external or public—reason: In disclosing Himself as the cowherd boy of Vrindavana—as the best companion, the most darling child, the most enchanting lover—Krishna revealed the supreme feature of the Absolute Truth. It quite exceeds the range of ordinary spiritual practice. So even though Krishna showed Himself in Vrindavana, He still remains inaccessible to even very devout religious observation. Therefore, Krishna descends again, in the role of His own devotee, to give the world the most powerful process of devotional service. Thus, Sri Chaitanya Mahaprabhu makes Krishna available. In 1510, having entered the renounced order of life, Sri Chaitanya Mahaprabhu quit His home and relatives in Bengal and journeyed to Jagannatha Puri. He immediately amazed the whole city: a twenty-four-year-old sannyasi, He turned its greatest resident, the renowned logician and scholar Sarvabhauma Bhattacarya, into His ardent follower and advocate. Sri Chaitanya did not stay to enjoy His fame: He left almost at once to tour the holy places of South India. He returned just as preparations were underway for the Ratha- yatra festival of 1512. The events that transpired next have been skillfully recounted by Krishnadasa Kaviraja Goswami in Sri Chaitanya- charitamrita, his biography of the Lord. To understand the import of these events we have to consider the significance of Jagannatha Puri and its festival in light of the Lord’s purposes in coming as Sri Chaitanya. His public purpose was to deliver Krishna freely to everybody. The highest feature of the Godhead, Krishna, is rarely attained. But Sri Chaitanya is so merciful that He makes what is most sublime and rare easily obtainable by all. As the very personification of divine mercy, Sri Chaitanya naturally chose to worship at Puri, for Lord Jagannatha, who leaves His temple to appear personally before even the most fallen, is the perfect embodiment of God’s unrestrained kindness. Moreover, when Lord Jagannatha takes His journey, devotees congregate by the thousands and join together in exuberantly chanting the names of the Lord. This is also significant, for Sri Chaitanya specifically descended to teach and spread nama-sankirtana, the congregational chanting of the holy names of God. Chanting God’s transcendental names is so spiritually powerful that it can transmute even the most base people into the most exalted and radiant lovers of God. Thus Jagannatha’s chariot festival is practically the image of Sri Chaitanya’s own mission. As the day of the festival drew near, Sri Chaitanya personally took part in the preparations. Two miles up the coast from the great temple of Jagannatha stands a modest but very attractive temple with milk-white walls and a russet roof, nestled among tropical gardens. A steady ocean breeze playing through the gardens surrounds the temple with a soothing sururrus and bathes it in cool and refreshing currents of air. The temple’s name is Gundica. Here the chariot parade ends, and in the restful atmosphere of this still country place, Jagannatha, Balarama, and Subhadra remain for a week of leisure. The rest of the time the temple stands empty. All year long the vacant temple collects dirt, sand, and straw; cleaners are sent just before the festival. It is considered a menial’s job, so Lord Chaitanya surprised everybody when He set out with hundreds of devotees, brooms, and waterpots to clean Gundica temple for the arrival of Jagannatha. In great jubilation, the Lord swept every surface of the temple—floors, walls, ceilings—chanting Hare Krishna all the time, and His followers swept and chanted with Him. He swept so energetically His entire body became coated with dirt and dust. Sometimes the Lord shed tears of devotional ecstasy, and with those tears He washed the temple. Finally, He gathered all His sweepings into a single pile, throwing it outside. The others did the same. Sri Chaitanya’s pile was by far the largest. Again they swept the whole temple, meticulously removing the tiniest bits of dust, grit, and straw. Then a hundred devotees came in with brimming water-pots, and Sri Chaitanya began vigorously throwing water on all the floors, walls, and ceilings. Devotees crowded about a lake and a well nearby filling pots; others rushed back and forth in lines with full or emptied pots. In the temple, water flew in great arcs and every surface was washed and scrubbed again and again. Everyone in the temple, in the water lines, in the filling places, ecstatically chanted the names of Krishna. Lord Chaitanya got down on His hands and knees and mopped the floor of the temple and polished the throne of Jagannatha with His own robes. Then it was finished. The temple shone. It was cool, radiant, immaculate—as cool and bright, Krishnadasa Kaviraja says, as Sri Chaitanya’s own heart. It was fit to receive Lord Jagannatha. In cleaning the Gundica temple. Lord Chaitanya vividly demonstrated how one should diligently clean his own heart to make it fit to receive the Lord. In the material world we have closed our hearts to Krishna, and for many lifetimes our empty hearts have been collecting all the dirt and debris of material desires. If we wish Krishna to return, we must thoroughly wash all that contamination out of the heart, just as Lord Chaitanya swept every speck of straw and grit from Gundica temple. If we use the cleaning process given by Lord Chaitanya and regularly chant the Hare Krishna mantra, our hearts will soon become bright and clean and cool and peaceful. Lord Krishna will then joyfully take up residence in that purified place. Gundica was prepared, and two days later the three huge chariots stood in the morning sun before the gates of the Puri temple, awaiting their transcendental passengers. A vast crowd packed the streets. Inside the gates, Sri Chaitanya watched Lord Jagannatha, surrounded by powerfully built bearers, proceed from His throne to His chariot. Stout cushions led across the courtyard like steppingstones, and the bearers, muscles and veins bulging, lifted the large and heavy form of Jagannatha from cushion to cushion. Sometimes a cushion would split open with a heavy cracking report, and clouds of cotton wadding would fill the air. As Lord Jagannatha moved toward His chariot, Lord Chaitanya loudly called out to Him, “Manima! Manima!”—“My Lord! My Lord!” But the tumultuous din of musical instruments drowned out His words. As Lord Jagannatha drew near His cart, Sri Chaitanya saw Maharaja Prataparudra, the King of Orissa. The King was bending over with a gold-handled broom, carefully sweeping the road in front of Lord Jagannatha. The King had long desired to have an audience with Sri Chaitanya, and the Lord had steadfastly refused. As a member of the renounced order, Sri Chaitanya was forbidden to have any connection with worldly men. But when Lord Chaitanya saw the crowned head of state personally performing this menial service for Lord Jagannatha, He became very pleased and resolved to show the king all mercy. As Lord Jagannatha prepared to depart for Gundica temple, Lord Chaitanya organized His close followers into seven groups for sankirtana, congregational chanting. Each group had two drummers, a dancer, a lead chanter and five others to respond. Sri Chaitanya placed four chanting parties in front of the chariot, one on each side, and one in the rear. The thick ropes that draw the chariots stretched tight, and as the crowd shouted in joy, the ponderous wheels began to turn. As the three huge chariots started to inch forward, the hundreds of mirrors that decorated the chariots flashed in the sun. Festoons of bright silken cloth billowed and shimmered. Scores of white yak-tail whisks hanging in rows swayed back and forth in unison, and bells and gongs of all shapes and sizes clanged, chimed, and tinkled. The chariots’ cloth canopies, shaped just like the great stone dome of the Puri temple, moved stately and majestically; each vehicle was a temple in motion. As the wheels of Jagannatha’s car started to turn, fourteen drums began pounding together. Nearby, the king stood with his confidant Sarvabhauma Bhattacarya, and together they watched as Sri Chaitanya began to dance before Lord Jagannatha in ecstasy, chanting the names of Krishna. Sometimes He flung His long arms high over His head and chanted, “Jaya Jagannatha! Jaya Jagannatha!” (“All glories to Lord Jagannatha!”). As Lord Chaitanya danced. He remained facing the steadily advancing chariot and kept His eyes fixed upon the large-eyed, smiling countenance of Lord Jagannatha, riding above and always moving toward Him. And Sri Chaitanya began to sink deeper and deeper into a specific emotional ecstasy elicited by this Ratha-yatra journey of the Lord. The chariot ride of Lord Jagannatha commemorates a particular incident in the pastimes Lord Krishna displayed on earth. Sri Krishna had spent His childhood and youth in the rural simplicity of Vrindavana, enjoying fully His intimate affairs with His boyhood friends, with his parents, and with the gopis—the cowherd girls. But the Lord had descended for an external purpose as well—to rid the earth of the burden of violent, demonic kings who were at that time oppressing the people and destroying religious principles. So when Krishna reached maturity, He left Vrindavana to fulfill that purpose. And so He ruled as King of Dvaraka, His kingdom by the sea, and led His armies against the demonic oppressors and, one after another, defeated them, thus restoring the reign of righteousness to the world. When Krishna left Vrindavana, He broke the hearts of all the residents. Their grief was beyond bearing, and no one’s grief was greater than Srimati Radharani’s. She had lost the Lord of Her heart, the Master of Her life. For love of Him She had sacrificed everything, loving Him, finally, without caution or restraint, allowing Her reputation to be destroyed, Her very life to be taken over and possessed by Him. And then—He had left. He had never returned. Now Her days and nights were spent in tears. Time became stultified. Each minute widened into an aeon, yawned into an endless gulf of grief. The whole universe was vacant. The anguish of Her separation became so intense at times that it seemed to plunge Her into madness. Srimati Radharani’s intense feelings of separation are transcendental, just as Her conjugal relationship with Krishna is transcendental. The prototypes of all relationships and the feelings are found in Krishna. These are original, while those we experience in this material world are merely their perverted reflections. The conjugal relation in this world, for example, is based on lust—that is, the desire to use the other to satisfy one’s own senses. But the original conjugal relationship between Radharani and Krishna is based on love. Love is the desire to satisfy the other, giving no thought to one’s own enjoyment. A person in love enjoys solely by seeing the satisfaction of the beloved. Thus love has no tinge of selfishness. So the spiritual love between Radha and Krishna is quite the opposite of what passes for love in this world. Moreover, material feelings, like the relations that evoke them, are fleeting and impermanent. But the feelings aroused in relation to Krishna are endless. They never fade, but ever increase in intensity. Although Srimati Radharani appeared to be suffering in separation, in truth She was neither suffering nor separated from Krishna. In the spiritual realm there is no suffering, for all emotions are varieties of ecstasy. Nor is there any separation as in this world. In Her transcendental separation, Radharani was more intimately united with Krishna than ever. In Her transcendental grief, She was actually experiencing the highest bliss. Separation intensifies love—that is true even in this world. Separate a mother from her child, and see how her material affection blazes up. Pure devotees desire only to increase their love for Krishna, and Krishna satisfies their desire by arranging for them to love Him with strong feelings of separation. Here love of God reaches its peak, and Sri Chaitanya, as the embodiment of Radharani’s love, spent His days and nights consumed by this highest and most intense mode of devotional feelings. The Ratha-yatra festival brought these feelings to their highest pitch. For the festival commemorates the single occasion on which Srimati Radharani again met Krishna. For many years Krishna had ruled as King of Dvaraka exhibiting in the splendor of His capital, the power of His army, the brilliance of His court, and the beauty and refinement of His queens all the opulence of Godhead. Then, on the occasion of a solar eclipse, Krishna left Dvaraka. Riding with Balarama and Subhadra at the head of endless columns of chariots, elephants, and palanquins, Krishna led His whole royal dynasty to a holy pilgrimage site called Kurukshetra. From all directions, many other royal households converged in state upon the place of pilgrimage. And finally, a small plodding caravan of bullock carts carried all the residents of the obscure cowherd village of Vrindavana, hoping to see their Krishna, who had left them long ago. And so Srimati Radharani came once more to behold the lover of Her youth. She first saw Him surrounded by His courtiers, riding in regal splendor. Later, They met in a secluded place. Now, after so many endless years apart. She was together again with the same Krishna of long ago. Her ecstasy was boundless. Yet, strange to say, the joy of meeting did not vanquish the feelings of separation that had possessed Her for years. On the contrary, those feelings became even more intense, even though Krishna—the same Krishna as before—was there. For now He was in royal garb, and all around Them were warriors and their horses, elephants, and the rattling of their chariots. As She looked at Krishna, She longed to see Him as the simple cowherd boy, carrying His flute, decorated with the forest flowers of Vrindavana. She yearned to see Him in the old places—by the bank of the river there, under the tree where They used to meet. Thus Srimati Radharani merged into the most powerful of ecstatic emotions, paradoxically uniting the ecstasy of union with the ecstasy of separation; the two were felt simultaneously, and they perpetually intensified each other. So although Her joy at having Krishna again knew no bounds, Her heart was breaking in separation. She yearned to take Krishna back to Vrindavana. The Ratha-yatra celebration, commemorating this event, is really the emotional process of bringing Krishna back to Vrindavana. Puri itself, with its majestic temple, is Dvaraka, and Gundica, set in rural gardens, is Vrindavana. And as Lord Chaitanya danced before Lord Jagannatha’s chariot on the way to Gundica, He merged deeper and. deeper into the feelings of Radharani. He lived through all Her feelings for Krishna, and expressed all of them in His ecstatic dancing. As Sri Chaitanya danced, Lord Jagannatha watched with great pleasure. King Prataparudra, together with Sarvabhauma Bhattacarya, was also intently watching, and the king became stunned with ecstatic love. Then it happened by the mercy of Lord Chaitanya that the king could clearly see the mystery of the Lord’s activities. He saw that Lord Chaitanya, the dancer, and Lord Jagannatha, who watched the dancer, were the same Personality of Godhead. The king directly beheld the mystery of the Lord: how the one Lord manifests Himself in transcendental variegatedness for the enjoyment of His pastimes. As the procession moved forward, Lord Chaitanya moved from one sankirtana group to another, now dancing in the midst of one, now the other. And then the king and Sarvabhauma Bhattacarya saw another mystery, witnessed only by the confidential associates of Sri Chaitanya: They saw Lord Chaitanya dancing in the center of all seven groups at once. The chanters in each group, not realizing that the Lord had expanded Himself by His spiritual potency to be in all seven groups, thought that the Lord had come to favor them. Sometimes as seven, sometimes as one, the Lord danced before the chariot. And sometimes all the groups would come together in front of the chariot to form a circle around Lord Chaitanya. Then Lord Chaitanya would dance with greater and greater energy. Roaring like thunder, leaping higher and higher, He hurled Himself in a circle so swiftly that He looked like the single incandescent ring formed by a whirling firebrand. Everyone became astonished, even Lord Jagannatha. The chariot came to a complete standstill and remained immobile while Lord Jagannatha watched with unblinking eyes the dancing of Sri Chaitanya Mahaprabhu. All throughout the parade, the chariot would stop and start, go slow or fast, as if it had a will of its own. Sometimes the car would stop and refuse to budge, even though the ropes were pulled with much force. Then, inexplicably, it would start to go forward again. Devotees have experienced the same thing in modern Ratha-yatras in Europe and America. The truth of the matter is that the chariot moves by the will of Lord Jagannatha, and not by any human agency. As the Lord danced before the motionless chariot, physical transformations induced by ecstasy appeared on His body. His skin erupted with goose pimples, and the hairs of His body stood on end: His body resembled a silk cotton tree, all covered with thorns. His teeth chattered so violently that people became afraid they would fall out. His body flowed with perspiration and sometimes oozed blood. His voice became so choked with ecstasy that when he tried to shout “Jagannatha!” He could utter only “jaja gaga, jaja gaga.” Tears sprang from His eyes as though expressed from a syringe, and people all around Him became wet. Sometimes He became stunned, crashing suddenly to the ground and lying immobile, scarcely breathing. His limbs hard as wood. Then He would suddenly leap up again, and tears, perspiration, and foam would fly from His golden body. 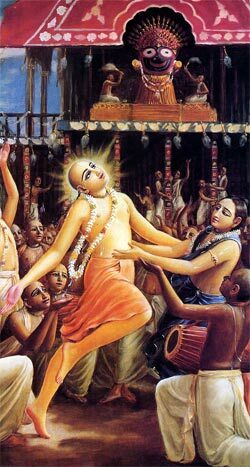 Now Sri Chaitanya, fully merged into the highest ecstasy of Srimati Radharani at Kurukshetra, began to dance rhythmically. Gradually He moved further and further out in front of Lord Jagannatha’s chariot, and then, in response, the chariot also began moving slowly forward. As Lord Chaitanya danced. He mimed in gesture the drama of the meeting at Kurukshetra, with all its tragic and exalted emotions. Lord Jagannatha and Lord Chaitanya again enacted that sublime pastime of transcendental love on the road to Gundica. Sometimes Lord Chaitanya danced out in front of the chariot, and so, in the role of Radharani, tried to lead Krishna back to Vrindavana. Out of her love for Radha, Jagannatha moved forward. Sometimes Lord Chaitanya would fall behind the chariot, thereby indicating that Krishna had forgotten the residents of Vrindavana, had put away the love of His youth, forsaking Her and all the others. Whenever Lord Chaitanya dropped in back of the chariot, the chariot would come to a stop. In this way Krishna—Lord Jagannatha—responded that He had not forgotten. Srimati Radharani—all of Vrindavana—remained dear to Him above all else. The chariot would stand immobile until Lord Chaitanya again came in front to dance, moving further and further ahead of the car. Then Lord Jagannatha again began to move slowly forward. In this way, Krishna admitted that He could not live without Radharani, that He could never be satisfied outside of Vrindavana. And in this way, Lord Chaitanya led Lord Jagannatha to Gundica, and satisfied Him fully. By His extraordinary pastimes with Lord Jagannatha during the Ratha-yatra festival, Lord Chaitanya manifested the most confidential ecstasies of divinity. People are wasting away in this material world, trying vainly to squeeze a few drops of happiness out of dead, dry matter. Lord Chaitanya disclosed these innermost pastimes of Krishna, opening this incalculable treasure of spiritual feelings, to show that nothing in this world can compare to Krishna. For a long time, the world has heard of God’s power and majesty, but it is not much attracted. Therefore, Lord Chaitanya also revealed God’s sweetness and beauty. The all-attractive feature of God was actually revealed when Krishna descended five thousand years ago. But Lord Chaitanya revealed it more completely and more openly by showing through His own ecstatic attraction how attractive Krishna is. We know how lovable Krishna is because in Sri Chaitanya we see how much love He evokes. And just as Lord Chaitanya at the Ratha-yatra disclosed the highest love of God, He also showed the way to attain it. He did this by organizing a powerful exhibition of sankirtana—congregational chanting of the holy names of God. This simple and natural practice possesses such immense spiritual potency that people with no spiritual qualifications at all can come to the highest level of spiritual realization. For the regular chanting of Hare Krishna destroys material desires—as Lord Chaitanya wrote: it “cleanses the heart of all the dust accumulated for years.” All kinds of material desires, gross and subtle; all the misconceptions of pride and egoism; all the furies of anger and hatred; all of these gradually fade and then utterly vanish if one chants the holy name with the same care and attention with which Lord Chaitanya cleansed Gundica temple. Then Sri Krishna will appear within your heart, and all of Vrindavana with Him. Lord Chaitanya’s sankirtana movement was revolutionary in that it offered everyone spiritual enfranchisement. Some of Lord Chaitanya’s followers were born as Muslims, others were outcasts because they had worked for the Muslim government. None of them was allowed to enter Jagannatha’s temple, yet they were the most advanced devotees of Lord Jagannatha. In worshiping intimately with these devotees, Lord Chaitanya showed that spiritual elevation is not a matter of birth or social status, but of purity. And since the chanting of Hare Krishna can purify even the most fallen, no one on earth is excluded from worshiping Lord Jagannatha. Thus Lord Chaitanya made Sri Krishna available to everyone. For twenty years He worshiped Lord Jagannatha at Puri, and every year He danced and chanted before the Lord’s chariot. As a result, Lord Jagannatha, ever merciful to the most fallen, now rides on His chariot in cities all around the globe, smiling on the whole world.